I’m filled with the sort of loving tenderness for my children that comes from knowing that they’ll be leaving me tomorrow. It was a long day. The morning started with technical difficulties, M still simmering with resentment over a disagreement yesterday, and J fretting anxiously over her need to complete a homework assignment in lieu of actually sucking it up and doing the assignment. Before Cute W had even left for work, the girls had managed to set off our car alarm. There’s more to that story, but I’ll come back to it. So at 9:40 am, I decided that I was going to my exercise class. The schedule’s been nutty lately, and I’ve been missing many of them. My first instinct was to bike to the JCC, but I had some fears that, left unattended, the girls could potentially set off the car alarm again, so I ignored the gorgeousness of the day and drove to take the car out of the equation. And then, on the way, a road was closed. And once I arrived, there was no parking. Like, anywhere. Okay, there was parking, but it was far away, and it was a particular bummer, because if my kids had been in school, I would have biked. But, alright. Then, walking in, I ran into a friend, who broke it to me that the 10 am class I’d planned to attend had moved to 9 am for the school year. Ohhhhhh, I was sad. Really, the timing’s better in general, but now I had no class. In fact, I saw a favorite instructor heading in and hoped that she’d have a class, but she let me know in a nice way that this was more of a “sittin’ senior” kind of exercise class. So I went back to my car and sulked. The hour of exercise was supposed to be my little sanity break. Then I decided that, since the kids weren’t expecting me, anyway, I wouldn’t go straight home. I remembered that I currently possess a Starbucks gift card. Drinking coffee at an outdoor table, now that sounded good! By the time I was parking by Starbucks, I’d decided that I also fully deserved a trashy magazine to peruse while drinking my coffee. And then I remembered that I’d left my wallet at home–I’d just put my driver’s license in the pocket of my gym bag. 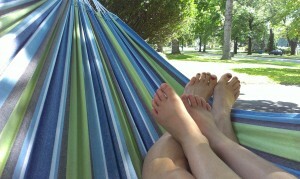 Much of the day was spent on homework, with occasion breaks spent on the Ripstik or in the hammock. By evening, things had improved. J was finished with her assignment and peaceful with relief. I stayed at M’s soccer practice long enough to watch her run ridiculously fast and meet the goal that she’d set. Then I went home and made a special chicken dinner because it would provide awesome leftovers for everyone’s first-day lunches. I’m convinced that my entire family loves me more when I am frying them meat. You might think that I’m imagining it, but I have a compelling stack of evidence, like how both daughters gushed that they love me, or Cute W declaring me The Best Mom Ever and particularly adorable sporting flour on my cheekbone. It almost makes me want to fry meat more often, except that then we’d all be much less healthy, and, more important, they’d start taking my meat-frying for granted (because I’ve noticed that I rarely get fervent declarations of love for providing clean underwear and icy-cold water bottles). As I was cleaning up after dinner, the girls sprung into First Day Eve action. J, who had been told it was time to head upstairs, asked if she could please get organized first? Of course you can, my little lamb chop. An excellent idea, and it’s more likely to make you mellow for sleep. I walked into M’s room to see her first day of school outfit all laid out: jeans shorts and a t-shirt. She checked my reaction: was I disappointed? Of course not! I’m sure that if I had a daughter who was carefully coordinating the various elements of her outfit and pondering her hairstyle choices, the whole process would make my heart swell. Many of her friends are doing just that, posting photos of their outfits, and debating the merits of sandals versus sneakers, and that just makes her complete lack of concern seem extra-awesome. And, as I was thinking this, J walked into M’s room. She was fretting because she couldn’t fit all of her supplies into her backpack. M volunteered her services, and soon the two of them were helping each other and preparing themselves with the kind of camaraderie that appears on special occasions like Christmas Eve and First Day of School Eve. And finally, bedtime. M and I had a semi-philosophical bedtime chat and J chose a selection of picture books (all total girl power stories, my favorite!). Those girls are awesome. I’m going to miss them tomorrow. Well, maybe. I loved reading about the homework assignment on the Kids Out and About Newsletter! (Especially the sentences she used to describe you and your husband!) Those leprachaun traps and Valentine’s day mailboxes must be universal; we do those here in Latham too. I hope the beautiful weather yesterday made up for your frustrating morning. Enjoy the first day of school! @Claire, aww, that’s nice. And you’ve created a teaser for anyone who doesn’t get the KOA newsletter yet! 😉 Hope your first day of school was great!